Noir Western, and the most understated of director John Ford’s pictures with the exception of Dust Bowl drama The Grapes of Wrath, which it resembles for its shadows and the righteousness of Henry Fonda. In this instance Fonda is lawman Wyatt Earp, come to clean up Tombstone in the 1880s and enforce all its laws except, presumably, the one concerning scene-theft, as committed by Victor Mature every minute he’s on film as Doc Holliday. Fonda lobbied hard for James Stewart in the role, and there are bar scenes in Frank Capra’s It’s a Wonderful Life two years later not unlike Mature’s saloon scenes here. 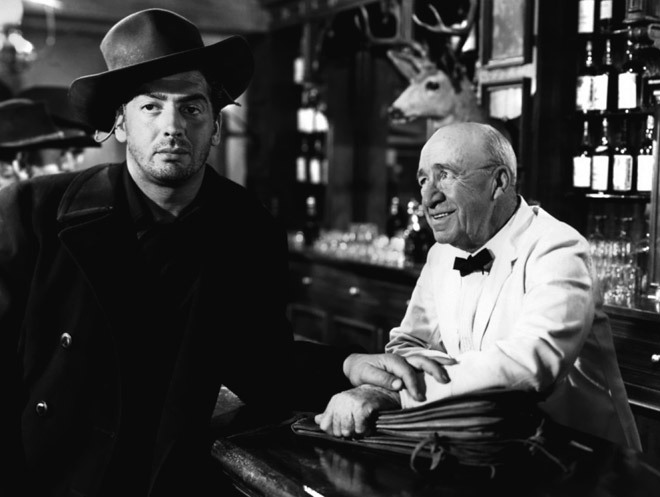 In the director’s first film after World War II, Ford exhibits little patience for his own characteristic sentimentality. Walter Brennan’s declaration as Pa Clanton—“When you pull a gun, kill a man!”—is as ruthless as any heard in not only a Ford film but any Western until The Wild Bunch by Sam Peckinpah, who considered Clementine his favorite movie. Ford insisted that his recreation of the gunfight at the OK Corral was based on Earp’s version as told to the filmmaker, and maybe it was; but if the facts are Earp’s, the poetry is Ford’s, his subsequently stated preference for the lyricism of legend over the details of history evident already.